New Swan Shakespeare Festival presents its third annual season of Shakespearean productions under the stars, in a unique and intimate mini-Elizabethan theater. Last summer the 125-seat theater-in-the-round hosted over 4,000 patrons at its sold-out shows, firmly establishing it as a destination event for summer entertainment, artistic satisfaction, and family fun. This season the Festival presents freshly imagined productions of Romeo and Juliet and Twelfth Night, which will run in rotating repertory July 10 through August 30. New this year are pre-performance seminars that will be held on many nights adjacent to the theater on the Gateway Plaza in front of UC Irvine’s Langson Library. The theater will also host its first musical event, Mozart Monday, a fundraiser on Monday, August 18. The evening features Maestro Benjamin Simon and friends from the LA Philharmonic in a program of chamber music by Wolfgang Amadeus Mozart. Exploring an issue that is all too prevalent today, the production will examine the faults that lie with the adult Montagues and Capulets: carelessly allowing the feud to continue, disregarding the vulnerability of their sons and daughters, and ultimately not taking seriously their responsibility. “It is the weight of this realization that we leave our audience to ponder,” adds MacLean. 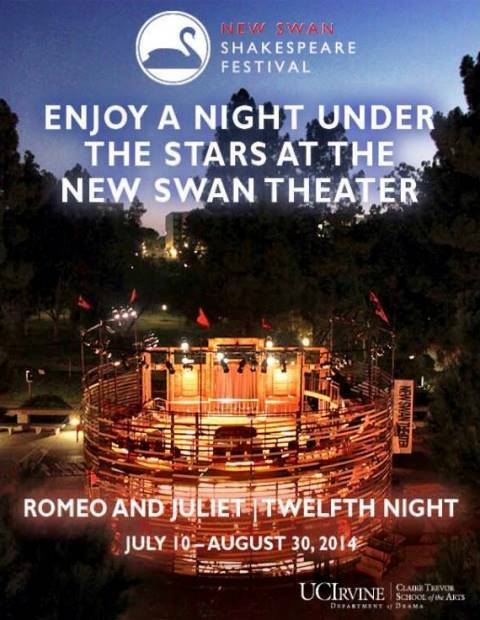 New Swan Shakespeare Festival is Orange County’s only professional Shakespeare festival performed outdoors in a sustainable, portable mini-Elizabethan theatre, the New Swan Theater, where the audience and actors inhabit the same dynamic, in-the-round space. Show time: 8:00 pm Wed. through Sun. Hi Julia, thank you for picking up the story!